My dear new homeschool friend, Marley, shared this Sidewalk Chalk Recipe with me. She and her daughter had a great time making it together. She wanted to make sure I told you to have your little one(s) help you with the mixing and coloring! Washable Tempera paint in the color of your choice! I chose red, yellow, green, purple, blue, and white. Bucket, pail, or large bowl that you can definitely throw away. Step 1: Grease molds, ice cube trays, or popsicle molds with Petroleum Jelly. Step 2: Mix 1/2 cup of Plaster of Paris with 1/3 cup water. Mix well and slow for about 1 minute. Step 3: Immediately add 2 TBS of paint (or more for desired color) and mix well. Step 4: Spoon into molds. Tap molds gently to settle. Step 5: Repeat steps 2-4 until all the molds are filled. 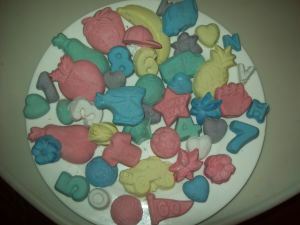 But only mix one color at a time otherwise the Plaster of Paris will start to harden before you're able to get all the chalk mix into the molds. Step 6: Let chalk dry overnight (or at least 12 hours). Step 7: Fill the disposable pail, bucket, or bowl half-way with water. Rinse containers and empty any Plaster of Paris chalk mix into the bucket. Discard pail. DO NOT let any Plaster of Paris go down the sink. It will harden and ruin your pipes.